I first read about this movie few months back when I was searching online for a Hotel in Tokyo for a friend. I came across Park Hyatt Tokyo at Shinjuku, in the description I read that the entire film “Lost in Translation” (2003) was shot here. The film had a 95% Tomatometer as well. I got the movie then but got around to watch it today. Last week “Raj” a friend of mine who works in Tokyo for last few years wrote in his Facebook wall about a BBC Documentary talking about Japan’s difficult future ahead with a population shrinking by 1/3rd in next 40 years. It was a nice one and a must watch, unfortunately they have removed it in YouTube after few days. BBC produces some of the best programs in the world, vailable online from their site but entire collection is Geo restricted to UK due to the fact BBC programs are British public tax payer funded. I wish they make the programs available for free world wide viewing through YouTube. 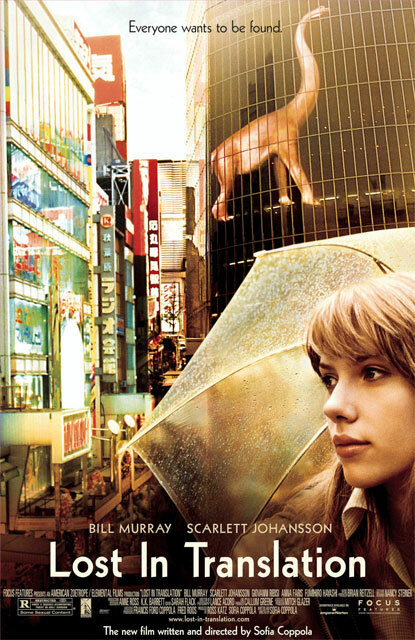 Coming back about the film, “Lost in Translation” is a slow drama about an aging actor (Bill Murray) who is staying for few days due to an advertisement engagement in Tokyo and about a young married woman (Scarlett Johansson) who is staying in the same hotel while her husband is away on a photography expedition. A non romantic friendship develops between them as they roam around Tokyo trying to spend their time. The film progresses slow, as the director Sofia Coppola creates the mood of sober and melancholy felt by both the main characters. As the film progresses we are transported to Tokyo, we can feel the lights, sound and smell of the metropolis. Tokyo is a city that if you visit once leaves an impression with you as it happened for me during my visits in 2003 and 2007. This film’s title reminded me a 80s Pop song “Lost in Music” by Sister Sledge and its stuck in my head for last few hours.